Bob removed a link from the Sunfire website? Anyone know anything about this? More shake-up at Sunfire? If you are referring to the "Bob Carver" name... Looks like the name is being taken off most of the Sunfire website. It looks as though they are trying to make the Sunfire name stand on it's own 2 feet without the backing of the "Bob Carver" name. It wouldn't make allot of scene to sell the company, and the new owner try to continue to base the company on the old owners name. Someday, for whatever reason, Bob will not be around, but the Sunfire name will keep moving forward, whether Bob is there or not. At least that's my guess.... who knows. It will be interesting what they do with the "Signature" series of amps and subwoofers. I looked at the website and found that they mention "Bob" a lot, without the "Carver". Only when they get around to the tracking downconverter, do they mention Bob Carver by name. I think it makes little difference. We all know that anything with a Carver name on it after Bob left is of little significance. We still revere the Phase Linears when Bob was there, but shun the rest. It will be the same for Sunfire. When Bob's influence has worn off, and Sunfire has gone "mass market", we'll stop buying that stuff, too. We all bought Carver-designed stuff because it was high quality audio equipment that was equal or better than anything in that price range, or, perhaps, double that price range. It doesn't mean that there aren't excellent products available - you'll just have to pay a lot of money for them. I'm always amused when there is disagreement on the forum regarding the merits of some piece of equipment based solely on its sonic capability without regard for price (e.g., the recent Oppo thread). Remember your roots guys. What brought you to Carver? You could have had a Krell. BillD wrote: I'm always amused when there is disagreement on the forum regarding the merits of some piece of equipment based solely on its sonic capability without regard for price (e.g., the recent Oppo thread). Remember your roots guys. What brought you to Carver? You could have had a Krell. You lost me with this statement; the Oppo IS an excellent unit at an incredible bargain price...?? Did I misunderstand? Well said BillD. You hit the nail on the head. Rabbit I think Bill meant the oppo is "hot" because of the value. My audiophile friend follows high end gear (it's his business) and told me the oppo is always among the top cdp's but always the least expensive. In other words some players may be "better" but they usually cost several times as much. Yes, frankieD, that was my point. And, lord knows, as I close in on 60 this year, my ears ain't what they used to be to enjoy the difference as much. Hell, I can barely hear anything much over 17 kHz anymore. I used to be able to hear the FM pilot signal very clearly if there was no notch filter to eliminate it. I wonder if it is a possibility that Bob might start up another company. Seeing that he now owns his name again, would he start up a company with the "Carver" named product again? 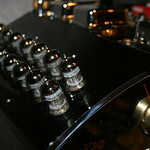 Should Bob Carver come back into the scene full force, I want audiophile 2-channel amps with meters. The meters look awesome on the Carver and Sunfire amps. dfronk wrote: I wonder if it is a possibility that Bob might start up another company. Seeing that he now owns his name again, would he start up a company with the "Carver" named product again? He's in his 60's now I think... He's probably thinking about retirement, and chilling with his family.